Here goes another tale of Tel Aviv, the home of hummus and diamonds, and the surrounding experiences as told with words and pictures. I was in Jerusalem already, on business, and grabbed a bagel from the Central Bus Station for breakfast as I headed towards Tel Aviv. 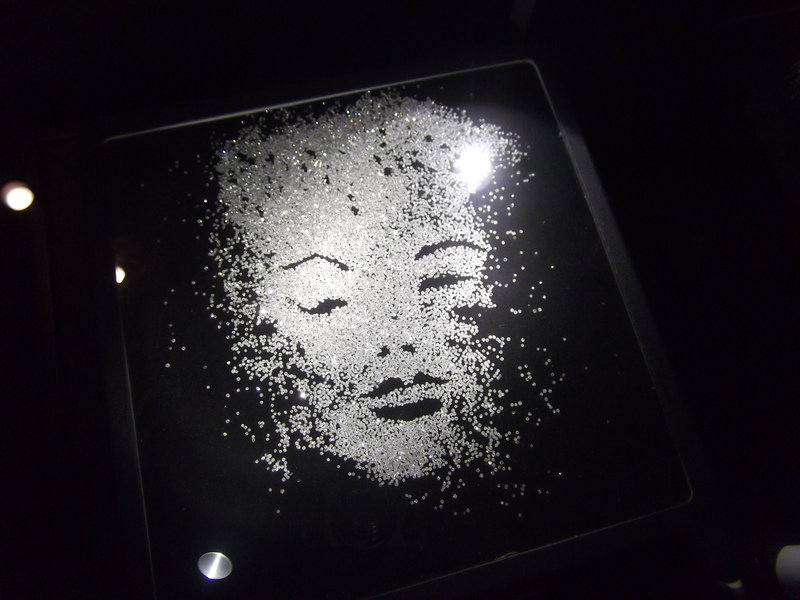 I confirmed by phone the location of the IDC (Israel Diamond Centre) Diamond Museum, which I’ve been wanting to visit for a while now, and once in Tel Aviv grabbed another bus to Ramat Gan – just a few minutes away from the Savidor Mercaz train station. There, looming over me and scraping the sky, the tall buildings of the famed Diamond District greeted me, occasionally shading me from the late morning sun as I sought out the museum. As an interesting side point, the roundish building below, on the right side of the photo, is the tallest building in Israel. Beneath the immense buildings I found an array of jewelry shops and restaurants and asked some security guards for directions to the diamond museum, whatever the name was. It was easy to find and I stepped into the Harry Oppenheimer Diamond Museum operated/owner by either the IDC or the IDI, I keep seeing conflicting reports, unless they are both the same group. 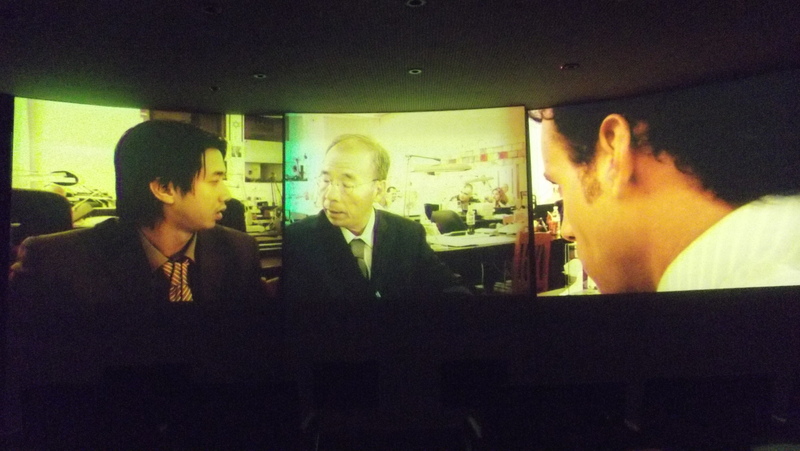 Regardless, I paid my entrance fee – which was reduced because I told them I am going to the army in less than two months – and had a personal guide instruct me on the correct uses of the little informational video stands. 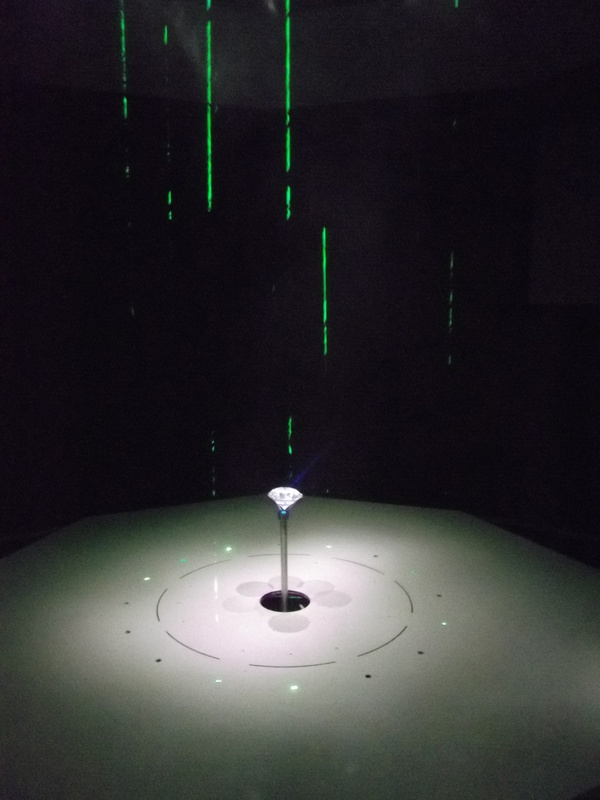 When I finished the video, having learnt some trivia about the local diamond industry – including the fact that Tel Aviv is one of the biggest diamond centres in the world, following only Antwerp and New York (I believe) – I examined the rest of the museum, the collections of other gems and semi-precious stones all left in their rough state, and headed outside. From there I walked into the IDC showroom and examined the finished products up for sale. As an interesting note, none of the Tel Aviv diamonds are blood diamonds. I did “sneak into” a special showroom section and consequently was forced to leave that special room and continue my browsing on the general floor. When I had seen enough of the millions of dollars of diamonds I left and searched for some more diamond locations. After nagging some guards I was reassured that there was no more to be seen save the scatterings of diamond retail and jewelry stores – but those I’ve already seen. As I was leaving I saw several chasidim heading into one of the buildings – no doubt diamond cutters as the chasidim have that in their blood, and become fabulously wealthy from the diamond industry. So with that final flourish, seeing the workers and the trade, I hopped back on a bus and and headed for one of Israel’s best and/or most famous hummus joints, an ideal lunch for a traveler in Tel Aviv. 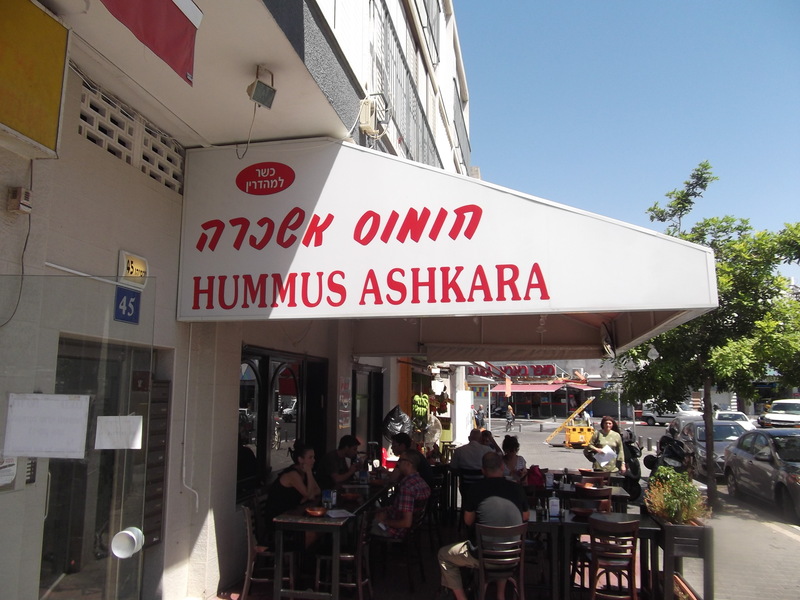 The hummus joint in my sights was Hummus Ashkara, recommended to me by several people and also featured on many of the “Best Hummus in Israel” lists that can be found online. Most, if not all, of the other famous/best hummus joints are owned by Arabs and do not have kosher certification, thus I cannot eat there. This one, to my joy, was 100% kosher and open for business. I headed for the Tel Aviv Port area and found the hummus I was looking for. Behind the counter, dishing the hummus, was a nice [Jewish] religious young man. Now it may look unfamiliar to some so let me break it down. 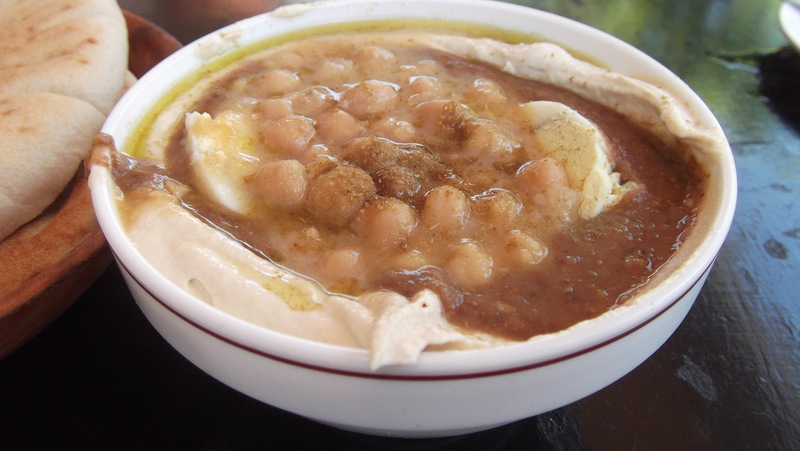 The beige paste around the edges is the hummus, the brown soup-like ingredient is beans and those spheroids are chickpeas. Also on top is a dash of spice, olive oil and perhaps lemon juice. Partially hidden is a whole hardboiled egg split into quarters. As I apprehensively scooped some hummus+ up with my torn pita piece, I began my journey – my first time doing the pita and hummus meal at a restaurant. It was exciting at first but then I noticed that there was only about 40% hummus in the bowl, the rest of it bean puree and eggs. I think that next time I’ll go with the hummus and tehina plain, they can keep the bean puree and eggs and give them to another customer. When I was done, having needed to “order” a third pita, I had mixed feelings. I think it could have been better but by all means, if you (dear reader) have never had hummus in a famous hummus joint then do so. After my hummus and pita lunch I decided to walk down Dizengoff Street and see some of Tel Aviv at a slow pace. I entered into some interesting shops, one selling really expensive pens (one costed ₪22,500 which is about $5,600) and other one that sold interesting tobaccos and cigars, from which I bought neither. Along with the interesting stores there are also scores of wedding dress shops and Dizengoff has become the place to go for brides looking for a dress. 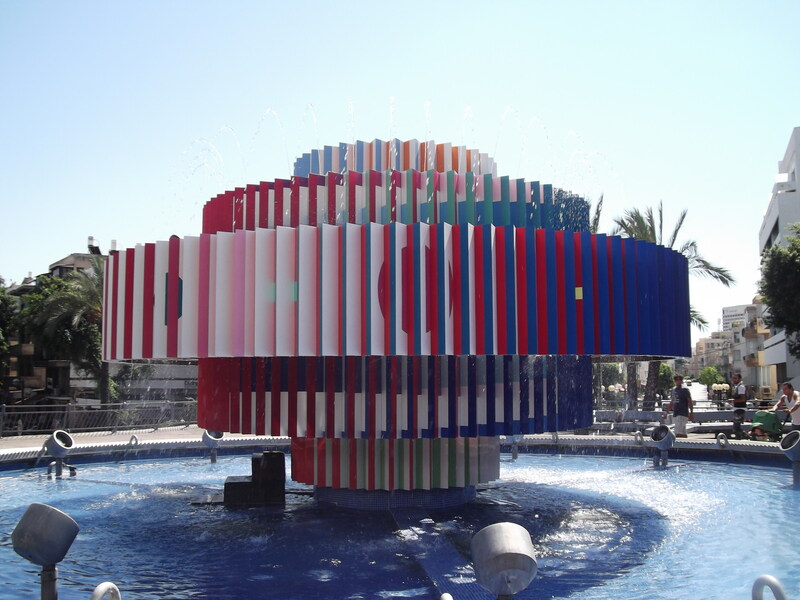 After walking at least halfway down the entire Dizengoff I came upon the famous Dizengoff Square and the landmark fountain up above, “Fire and Water” by Yaacov Agam built in 1986, having taken the artist ten years to build it. At night the fountain looks cooler and is supposed to shoot fire and water upwards but it has fallen into disrepair some and I do not know if the fire still erupts. 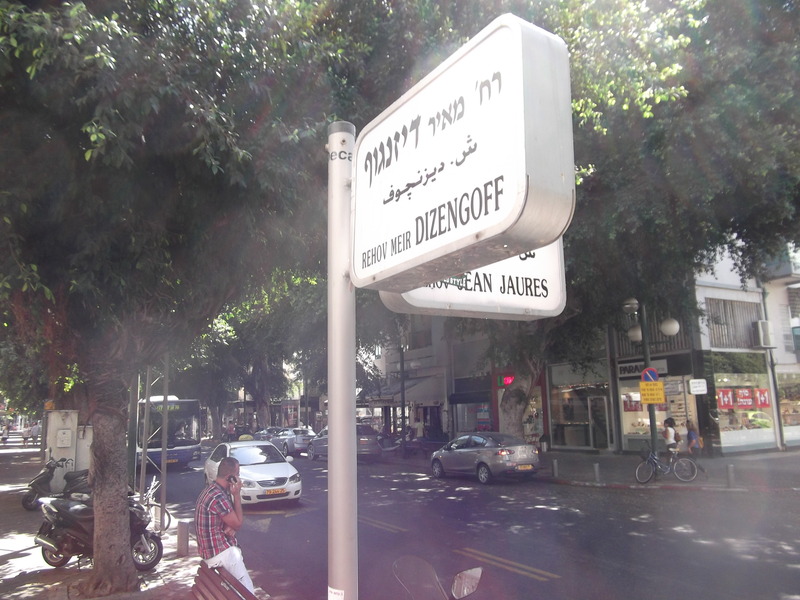 Beyond Dizengoff Square, going even further south, I came upon Dizengoff Centre. 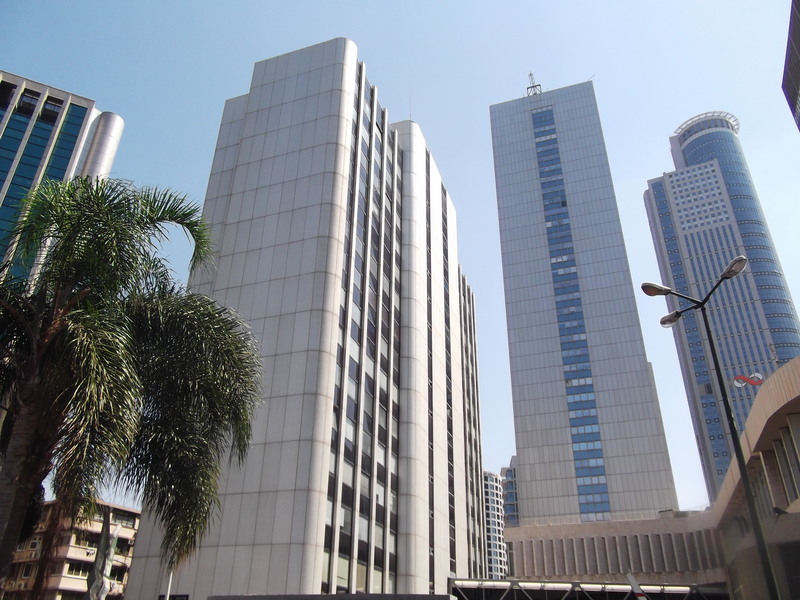 Basically it is just an extensive mall complex so I kept going, heading for Rothschild Boulevard. There, on one of the streets, I stopped and got myself a cool, refreshing drink at a fruit juice joint. 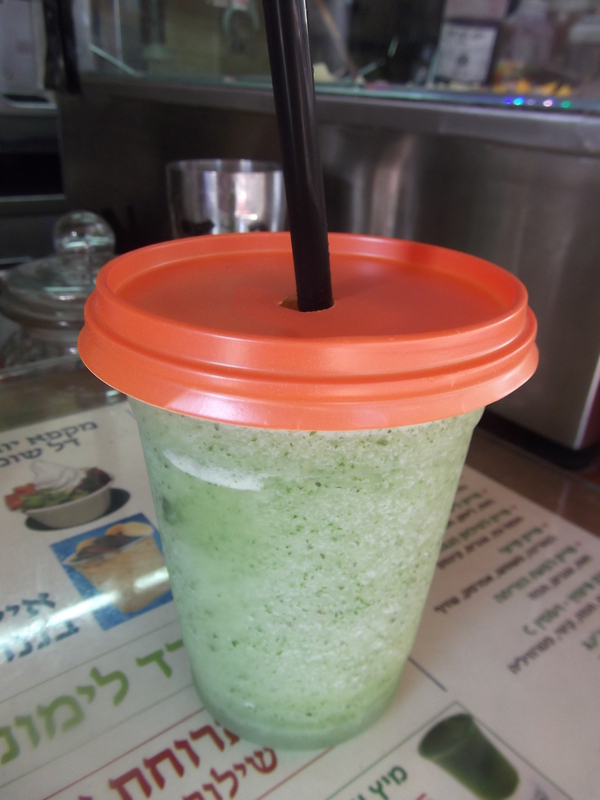 I got a freshly squeezed lemon and mint drink blendered with ice to create a delicious beverage perfect for sipping on in the muggy Tel Aviv heat. With cold, dripping beverage in hand I walked the length of Rothschild and then turned onto the charming Allenby Street where I nabbed a bus to the train station. On the way we passed by Rabin Square, where Yitzhak Rabin was assassinated the day after my 5th Gregorian birthday. From the bus to the train, then a layover in Akko and then another bus and I was home. I am eager to go back and continue my explorations of Israel’s second biggest city, Tel Aviv.